Nanjangud is known as the Dakshina Kashi. Ancient name of Nanjangud is Garalapuri and also called Gulapura. 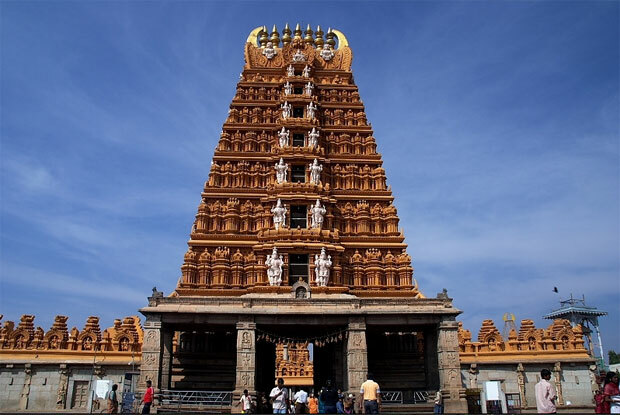 The famous Shree Kanteswara (Srikanteswara, Nanjundeswara) temple is situated here. The river Kapila (also called Kabini) passes through this place. The name of the river Kapila came from the sage Kapila Maharishi. Well known car festival of Lord Nanjundeswara is held here during March - April month. Newly married couple offer many things during the festival to get blessings of Lord Shree kanteswara. The main temple is believed to be constructed during Cholas and Gangas where King Rajendra was ruling. Later, during the period of Mysore Kingdom, many changes were brought to temple complex. The main entrance Gopuram was constructed during Krishnaraja odeyar - 3 period. One more Mantapam was constructed by a diety Nilagiri Papanna during the same period. This is being utilized for many functions (Sambhanda maale) which are held during festivals. Bilva tree, which is considered very sacred for Shiva Puja, can be seen inside the temple. The main temple length is 385ft and width is 160ft. Nanjangud is 22kms from Mysore on Mysore-Ooty road. Well connected buses and train facilty are available. Buses run almost continuously towards Nanjangud from Mysore. Private vehicles (vans) are also available. Buses going to Chamarajnagar from Mysore give stop at the main temple. Trains available to travel towards Mysore and Chamarajanagar districts from Nanjangud. Towards Mysore, 8.00am, 10.15am, 11.45am, 3.45pm, 5.50pm, 6.45pm and 9.30pm trains are available. Towards Chamarajanagar, 5.40am, 8.00am, 12 noon, 7.20pm trains are available. Nearest airport is at Mysore, 22Kms. Accomodation facility available adjacent to temple complex for all kind of visitors (single or group of people). Private lodges are also available in Nanjangud town for INR 400 - 500. Choultry facility available for functions. Charge is INR 15,000 per day. Single rooms available at choultry for INR 250 for two persons and additional INR 50 for extra person. No phone booking available at choultry. Total 25 rooms are available here. Dormitory facility available beside temple complex. 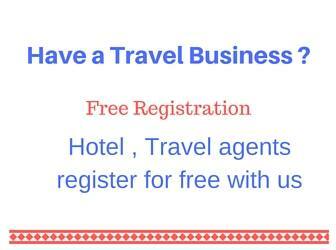 Charges are INR 150 per room (6 members). Additional INR 50 per for exptra person. Total 32 rooms are available. Rooms with attached bath room, toilet and AC is INR 400 per day. Charges for rooms without toilet, bath room and AC is INR 75 per day. Cottages are also available near the temple. Charges for furnished cottages is INR 800 per day. For non furnished cottages the charge is INR 500 per day. Contact 08221-226245 for cottage and rooms booking. Mondays, Thursdays, Fridays and during full moon days and Amavasyam (no moon day), the rush at the main temple is more. Free food and prasadam facility available for dieties visiting the temple. Food is served between 1.00pm to 2.00pm at Dasoha nearer to main temple complex. Approximately 30,000 visitors shall be served free food on Sundays and Mondays, 35,000 on Full moon days, 15,000 on other days. On Saturdays, Sundays and Full moon days, night dinner is also available. Paid prasadam can be obtained inside the main temple. Get the receipt for prasadam and produce at the prasadam counter to get the needed packet. Lord Shreekanteswara, Lord Ganesha, Goddess Parvati, Navagraham, Lord Basaveswara, Lord Subramanya swamy, Goddess Sharadamba, Lord Chandikeswara swamy, Lord Narayana swamy, Lord Nataraja (Thandaveswara). Sundays, Mondays temple opens from 6.00am to 8.30pm. Full moon days and special days (during festivals, Kartika masam (on Mondays)) temple is open from 5.00am to 8.30pm. Other days (Tuesday to Saturday) the temple is open from morning 6.00am to 1.00pm and from 4.00pm to 8.30pm. Abhishekam is performed during 6.00am, 9.00am, 11.00am, 12.30pm, 5.30pm and 8.00pm. Special darshan available on Sundays and Mondays from morning 8.00am. Cost of special darshan is INR 100. Tonsuring performed at the banks of the river Kapila from morning 6.00am to evening 7.00pm (charges - INR 40). There is a strong belief that many diseases and personal sufferings are solved just an offering (Harake) made by people for Lord Nanjundeswara. Some of these are, Hejje Namaskara, Urulu seve, Thulabhara, Shalyanna, Panchamrutha, Rudrabhishekam etc... Any seva which are to be performed, people have to pay the prescribed amount at the temple counter and a receipt has to be collected compulsarily. Offerings through money and ornaments can be put in Hundis inside the temple. Dieties who wish to send offerings from remote places can send in the form of Money Order, DD or Cheque to temple directly. No charges for puja and other related activities. For all kind of ornament offers receipt is to be obtained. Photography is strictly prohibited inside the temple complex. Parashurama temple, Shree Ramalingeswara temple, Chamundeswari temple, Village Goddess Maramma temple, Anjaneya temple, Ganapati temple, Ulloori Basaveswara temple, Kannika Parameswari temple, Sri Mallikarjuna temple, Uri Kathamma temple, Sri Dattatreya temple, Sri Satya Narayana swami temple, Sri Sringeri mutt. There is Ayyappa swami temple at the banks of Kapila river. Puja timings in this temple is from 6.00am to 8.00pm. Nearer to this temple, facility to keep the luggages (temporarily) for travellers is available. Visit the Mysore home page to get the details of other visiting places in this district.